With the high level of heat that is been experienced in all parts of Nigeria today, nothing can be compared to the joy derived from taking a chilled glass of water. There is a lot of health benefits of drinking water, apart from quenching of thirst and the satisfaction it brings to the body as a whole. Water functions properly when the right proportion is been consumed, and it can be termed as a cure for all human diseases. About 60% of the human body is made up of water and it is scientifically proven that we should be drinking at least 10 to 12 glasses of water on a daily basis so as to avoid various diseases. Whether cold or warm, there are great benefits of associated with drinking of water. Various enhancers can be added to the water to increase its taste and effects. Whether you are embarking on a weight loss program, looking for a remedy for menstrual cramps, wanting a healthy glowing skin or a healthy scalp and hair, or concerned about your beauty and overall health, water is simply the magic that you need. Drinking warm water accelerates blood circulation and fuels up your metabolism, which helps your body to degrade some quantity body fat and removing free radicals present in your body. It can also make you to feel full and controls your hunger pangs. Body toxins makes you to age faster. 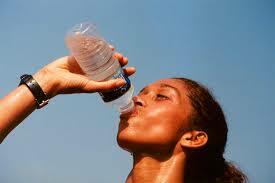 Drinking of warm water makes the temperature of the body to rise, thereby resulting to more sweating. Most toxins and free radicals get flushed away with the sweat. By squeezing some lemon juice, honey, and adding some cucumber, ginger, mint leaves etc in your water before drinking it, will help you in sweating out more of your body toxins. Warm water is one natural remedy for treating sore throat and common ailments such as cold and cough. It also helps in clearing nasal congestion. In order to make it more effective, you can add either lemon, ginger, honey, basil leaf juice or some aloe vera juice for quick relief. Not only a hot water bad eases out the pain experienced during menstrual cramps, but drinking warm water also relaxes your abdominal muscles, thereby relieving your menstrual pain. You can additionally add some raspberry leaf tea to your glass of warm water for quick relief. Drinking warm water also makes the hair to look soft and shinier. Warm water energises and activates the nerve endings in your hair roots and it also restores the natural vitality and health of the hair. Since warm water activates the hair roots, it results in accelerating your hair growth. Adding honey and lemon juice to a glass of water before drinking it will produce a soft, shinier hair. Drinking a glass of warm water daily in the morning on an empty stomach can help your body to detoxify any remaining foodstuffs. It also makes the movement of the particles more smoother and less painful through the intestines, thus enabling a smoother bowel function. For a smoother digestion process, drink warm water mixed with lemon or ginger juice. These are the few health benefits of drinking water, feel free to add more in the comment box below.